In Belgium, we can find a wide variety of agroforestry systems, ranging from alley cropping, tree lines surrounding fields, orchards, hedges (with or without valuable-trees) to riparian buffers. But also within the free range areas of poultry, pigs or deer we can increasingly find silvopastoral systems, besides the more classical trees on grazing land for cows. During the last 8 years, we estimate that about 650 hectares of new agroforestry systems (often alley cropping) have been planted. Particularly in the northern part of the country, fruit and nut producing trees are becoming increasingly popular, also in the context of community supported agriculture and short-chain marketing. During the last 5 years, more than 100 kilometres of mixed hedgerows have been implanted in an agricultural context, more often in the Southern part of the country. 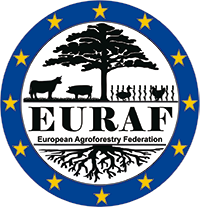 The two main agroforestry associations in Belgium are Agroforestry Vlaanderen (in the North) and AWAF (in the South). AWAF asbl – Association pour la promotion de l’agroforesterie en Wallonie et à Bruxelles – was created in 2012 on the initiative of practitioners, farmers, advisors and consultant, researchers and associations ... active in agroforestry. Today, the number of members is close to 40. Activities consist in the promotion of agroforestry, in all its forms, by conferences (5 per year), newsletters (6 per year), articles, field visits (2 per year). Every year, we organize agroforestry training for farmers. We are also involved in two development projects: the first one is an INTERREG project called ‘FORETPROBOS’, the second one ‘AFORCLIM’ is dedicated to the agroforestry’s ability to help agriculture cope with the effects of climate change. A new project specific to hedge management will begin in the coming months. Agroforestry Vlaanderen (Agroforestry in Flanders) is an informal network of about 6 organisations active in Agroforestry, coordinated by ILVO. It’s main aim is to strengthen and connect knowledge and experience on agroforestry, through research, participative actions and a great mixture of communication/dissemination activities. Currently, six projects are linked to this group. Agroforestry Vlaanderen hosts the platform website www.agroforestryvlaanderen.be and its related newsletter. The main objective of this platform is to make all agroforestry related information, activities, networks clearly visible and accessible to all. Besides scientific research, we organise excursions (both in Belgium and abroad), field visits, trainings, network meetings, information events, (free) advice for individual farmers engaging in agroforestry, and policy-related communication and interaction. There is a difference between Flanders and Wallonia. While in Flanders, the 'agroforestry' submeasure 8.2 is applied, it is not in Wallonia. However, also in Wallonia financial aids are available for planting (80 to 100% of eligible costs) of hedgerows, orchards and tree rows.